This is the first Misa collection I've loved since the Poisoned Passion collection in 2008. From the looks of these colors, Misa is going back to their roots- awesome duochromes and interesting shimmers. I'm very happy to see this as I've been so disappointed by the uncharacteristically bland collections they've released the past few years and I'd really been hoping they'd bring back their old Misa style. This collection is called Surreal Escape and it's really cool. Beyond Infinity. In my opinion, the only 'dud' of the collection. It's a plain dark slate shimmer. It doesn't have the speckles and sparkles that are seen in the other greys. The name of it still cracks me up, though. I won't be able to wear this without shouting, "To infinity... and beyond!" Grey Matters. Now we're talking. A pale neutral grey with black (or dark grey) and silver speckles. You'll want to enlarge this to see the speckles. It looks SO COOL. Like Zoya Harley but with more/darker speckles in it. Not glittery, not sparkly... Speckled. Like bird eggs. Phazers on Stunning. My favorite of the collection. This is a bright metallic yellow-toned green with strong red-brown duochrome and slight grey duochrome plus a light dusting of silver microglitter. My pictures don't capture how cool this one actually is. One day when I have better lighting, I'll try to get some better pictures. This color is amazing. Shields Up. This one is basically Wet n Wild Gray's Anatomy / Deborah Lippmann Wicked Game, but with a little bit of flat/flake shaped silver microglitter. It goes from dusty purple to grey and from silvery grey to blue and green. This one is more opaque, but not by much. And this sound effect plays in my head when I put it on. Red alert! Shields up!! Spaced Out. This one is a lot like Grey Matters, but instead of being neutral, it's a cool, blue-toned grey and it's a bit darker. Same awesome black and silver speckles. The Great Green Whatsit. This one looks to me like a lighter version of Wet n Wild Caribbean Frost with a bit of silver microglitter. Very frosty metallic blue green that flips from all green to all blue and then something in between. Least color shifting of the three duochromes. There's purple duochrome visible in the bottle but it doesn't show up on the nail. The silver glitter is pretty. The formula on these wasn't my favorite, but it was manageable. It was thick and a little hard to even out and it was very prone to bubbling. I had to wait a good 3-5 minutes in between coats on the multichromes to prevent bubbling and I'd suggest you do the same. The greys didn't have the bubbling problem, but they were thick and stiff feeling. I did three coats of all; the duochromes needed it but the greys were fine with two. The drying time is extremely long. Overall, not all the colors are completely unique, but they're definitely a lot different from all the other colors we've seen this fall. I have a mega weakness for duochromes and I'm very fond of grey, so this was an instant win for me. I love the names of these. I don't think the formula is that fantastic, but the colors are worth it. Most of the frosty streaks in the duochrome colors disappear as they dry and they turn into really bright, chrome-like metallics. Very happy to see Misa returning to their former glory. I hope this trend continues. So much potential. OMAGAWD, I was all about the bottle pictures, but DAMN Phazers on Stunning is good. I'll be picking up a few of these even though the formula has something to be desired. I agree that the colours are worth the poor formula. Thanks so much for the post! i want them all , as of late misa and I fell back in love !!! I love Phazers on Stunning and Beyond Infinity... amazeballs. OMG, Beyond Infinity is definitely in my wish list now! Thank you for the swatches,SCrangie. I have to say I actually love Beyond Infinity,looks pretty on you. The other one I really love is Shields Up.I attempted to make the photos big, but for some reason blogger is doing something not right. I click on the photo,and there is a screen,with a slide show at the bottom,and says" Image from http://4.bp.blogspot.com/-NP-E37LYZRQ/TneGYFmuPHI/AAAAAAA..." Is any one else having issues enlarging these photos? Thalie, uh oh... That's new. I see what you're saying- when I click on them it gives me a slideshow. It does show the images for me, but I don't want it to do the slideshow thing! Crap! Would it be safe to say these are 'dusty' colors? I love them all! You show them so beautifully it's hard to believe they gave you any trouble to apply. Kimberly, haha thank you :) They were thick and sticky but not impossible to apply. As for the dustiness... Some of them seem dustier than others, I'd have a hard time classifying them as definite dusty shades because there's so much contrast in them! WOO! Thanks so much for swatching these... as predicted, I need almost all of them. Hooray for Grey Matters -- I love Zoya Harley but always wished the specks were darker / more pronounced. I am ordering these *right now*. These are great colors, and they have fun names. Thanks Misa!!!! I love this whole collection except for the green polish. I will hopefully buy The Great Green Whatsit soon, it's super pretty! Ugh! 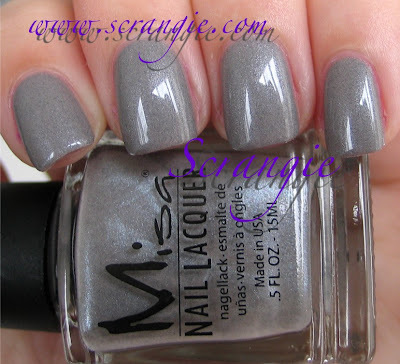 More polishes to add to my wishlist....Loving Grey Matters and Spaced Out! Gray Matters IS amazing when you enlarge it. I also love Phazers! But alas...no place around me carries this brand. Looooove phasers on stunning, can't wait to get mine!! Thanks for the fast pix of this surprising collection!! beachgal, you can find them tons of places online. I ordered mine from nailsupplies.us (along with more Seche, some swatch wheels, another China Glaze polish, and... I need to stop this). Lindos todos !!!!!!!!!! Quero todos !!! Beijos. I love the color palette! WTG Misa! This is a great collection. About time Misa! I haven't bought any Misa's in quite some time. I'll probably be buying all of these. I love Phazers on Stunning, amazing! Thanks for the post! I'm loving the speckles in Gray Matter. I'm hoping to kill a lemming by finding a light blue-and gray speckle that looks like old-school blue jeans...any suggestions? omg i'm totally loving this collection! and the name of it, which is somehow or other, the same as my email! (coincidence much?!) i totally have to get my hands on these somehow! we don't get it here in australia! Wow, I just love Phazers on stunning. I'm so upset I didn't order Grey Matters! Thanks for great swatches. The gray one is my absolute favorite. Beachgal, you gotta start shopping online! I'd never buy any nail polish if my only option was shopping at local stores! Cora, ehh... Speckled colors are hard to come by! I bet you could franken one by adding a few drops of pastel blue to Grey Matters! The Wet'n'Wild colors you mentioned were so water down to me. I have this collection by Misa and the color pay-off is much better (2 coats did for me). My lot turned out to have good consistent formula and did not bumble up at all. I'm happy with the purchase, I think Misa's prices are pretty good! I got all of these except for "Shields Up" -- I'm not so much for the lavender/green combos. They're all really fantastic in person! Notes: The greys really need a glossy topcoat to bring out their faint silver shimmer, and The Great Green Whatsit DOES flash violet-purple for me, but only in some lighting. Outside, not so much, but near my fluorescent-bulbed bedside lamp? WHOA AT THE VIOLET DUOCHROME. Hi. Your pics always make me want to buy all these polishes hehehe. Thank you for the great photos. By the way, would Essie's Fair Game be anything like Misa Beyond Infinity?